Don’t you hate it when ads make you feel threatened, causing you to react out of fear. We certainly despise that. Google’s recent announcement that they are changing the way they deliver search results on mobile devices is causing panic among folks with websites. At least that’s what web developers want you to think. Granted, there is cause for alarm, and concern, but take a deep breath, and give us a call. We can help you get your website mobile friendly, in due time. The crux of the issue is that Google wants to deliver more appropriate search results for people using mobile devices (smartphones and tablets) so they are favoring websites that are “mobile-friendly” meaning they reconfigure for mobile devices automatically, and are structured for mobile interfaces. Most all of the websites we create at McQuillen Creative Group are made this way. (All MCG websites are designed and programmed right here in Aberdeen, South Dakota). Please don’t confuse “mobile-friendly” with “mobile optimized.” These are two different things. Optimized suggests alternative and additional considerations were made to the mobile version to accommodate special mobile usages. 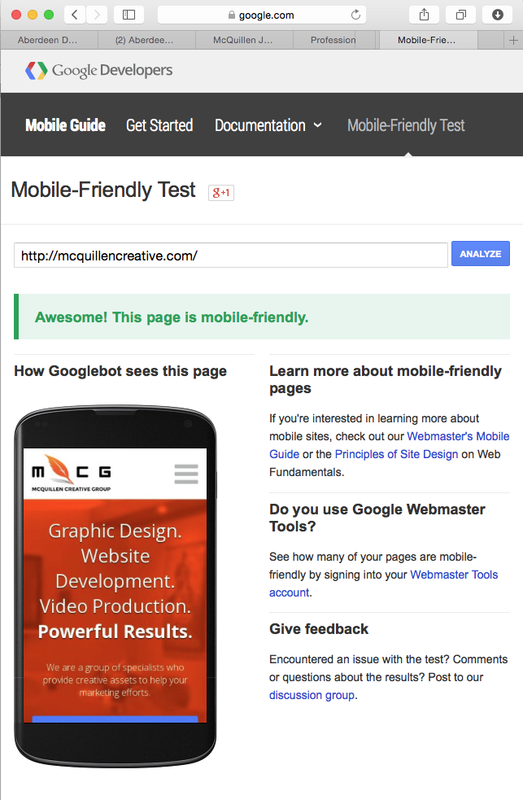 You can use this test page to find out what Google thinks of your website in terms of mobile usage. If your results stink, give us a call. We’d be happy to discuss some options with you. Read more about Mobilegeddon at USA Today.